#15 1998 - Iowa State @ Austin - The game itself wasn't that great. Sloppy defense on Texas' part allowed Iowa State's Bandhauer to throw 437 yards of passing offense and 5 touchdowns. But Ricky Williams rushed for 350 yards on 37 carries for 5 touchdowns. The five TDs pushed him ahead of Indiana's Anthony Thompson as the NCAA career rushing touchdown leader with 65 touchdowns and six games left to play. The 350 yards made Ricky UT's single game rushing record holder finally surpassing Roosevelt Leak's 342 yard record set in 1973 versus SMU in the Cotton Bowl. Ricky came mighty close in the previous game versus Rice when he only had 318 yards and six touchdowns. At the conclusion of the ISU game, Ricky moved to fourth place in career rushing yards with 800 needed to surpass Tony Dorsett with 6 games to go. The game also had Texas' first block of an opponent's extra point conversion with return for 2 points. Joe Walker blocked the kick and Tony Holmes ran it 93 yards for two points. Tony enjoyed the run so much he duplicated the feat returning an intecepted try-for-two 104 yards for another 2 points. Returning two failed extra point conversions for 4 total points was another NCAA record. #14 1993 - Syracuse @ Austin - Texas prevents #6 Syracuse from leaving with a win including two missed game winning field goals by Syracuse in the 4th quarter. The only and last(?) time I ever saw the tower lit up half and half for a tie. #13 1992 - Oklahoma @ Dallas - Texas deals OU its worst beating in the series since 1983 and ends it no rushing TDs streak also since 1983! 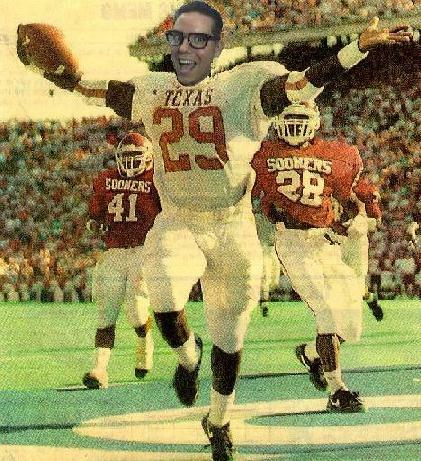 UT gives up two TDs with 2nd string defense allowing less harm to OU pride. Gardere becomes the only quarterback to win 4 games against OU. The OU fans chant "Graduate" at him! 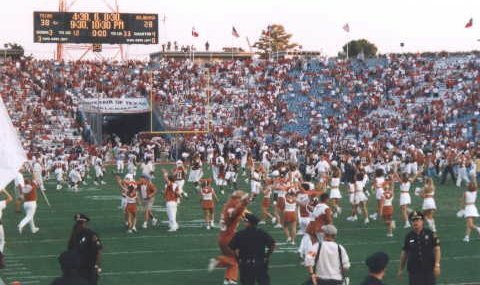 #12 1999 - Oklahoma @ Dallas - Texas overcomes its biggest deficit, 17 points, in my 104 games and beats OU, 38-28. The 1965 A&M game was the last time 17 points were overcame. Major Applewhite sets a TX/OU passing record with 328 yards and throws his 4th and UT record setting 300 yard game in one year with five games to go. Hodges Mitchell's 204 yards surpass Ricky Williams 203 vs Mississippi State and 138 vs Oklahoma in both his Cotton Bowl appearances last year. #11 1990 - Oklahoma @ Dallas - Texas comes back in the 4th quarter with a 2 minute left, 4th down and seven, 16 yard pass from Gardere to Keith Cash. OU's Lasher misses an easy field goal on the final play to give Texas the win. 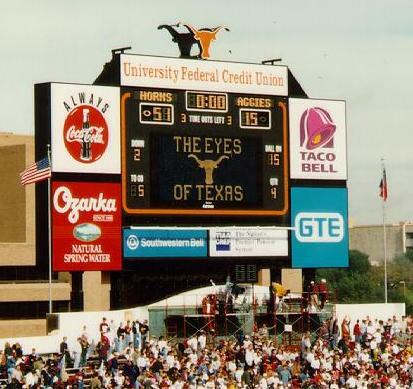 #10 1984 - Auburn @ Austin - My first Texas game ever and what a game it was! Jerry Gray runs down Bo Jackson after a 53 yard run and seperates his shoulder in the tackle. Bo has to wait til 1985 to collect his Heisman trophy. The 35-27 win over Auburn plus a 28-3 win over Penn St. the following week rocket Texas to #1 in the nation. #9 1990 - Texas A&M @ Austin - Texas ends its 6 year losing streak (20% of all the games it ever lost to A&M in 100 years) and puts an exclamation point on its undefeated in conference, SWC championship. The game culminated in CBS broadcasting the aggies two point, go for the win, play call which Texas stopped. 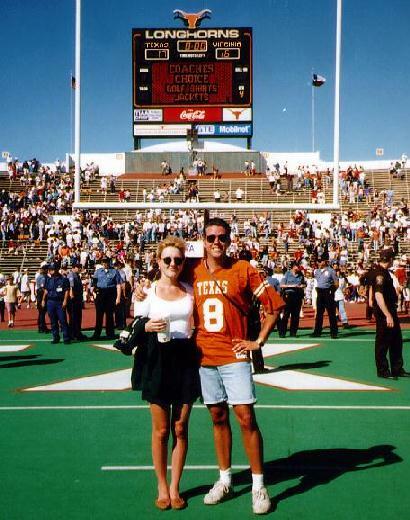 #8 1995 - Virginia @ Austin - For the first time in 103 years, Texas won, 17-16, on the final play of the game with a field goal, and then a 50 yarder into a 20mph wind, upsetting #14 Virginia in a wild scoring 4th quarter. #7 1995 - Texas Tech @ Austin -Texas achieved its largest margin of victory in the 45 game series versus #23 Texas Tech, 48-7. Tony Brackens crushed place kicker Tony Rodgers stopping a fake field goal attempt. The entire west stands gave a collective "ooooh" as Mr Rodgers landed on 2nd lane of the track. The video of the hit was the opener for ESPN's coverage of any college football game for the rest of the season. 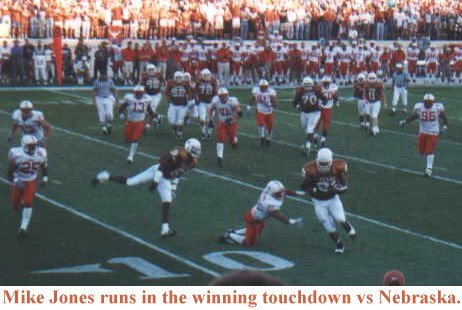 #6 1996 - Texas A&M @ Austin - Texas eliminated any thought of the aggies getting revenge from 1995 and dancing on Memorial Stadium. Texas scored 28 straight points at the start of the second half and only blew a kickoff coverage to allow the aggies a touchdown. 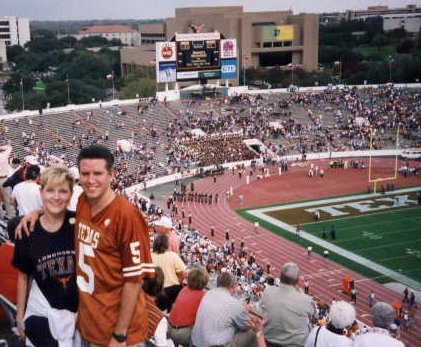 Waiting 13 years for such a victory (51-15) inspired me to propose to my sweetie in the stadium as the game ended. #5 1999 - Nebraska @ Austin - Undefeated, #3 Nebraska comes to Austin for the first time since 1960 looking to avenge its two straight losses to Texas. My best tickets in years puts me on the 4th row of the new stadium expansion on the North side 1 yd line. All scores happen in the south zone and Nebraska goes up in the 4th quarter. 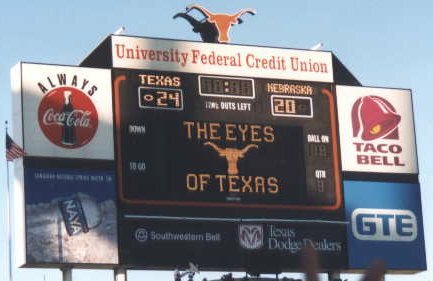 Texas scores the only against-the-wind points of the game when they matter most, 20 feet away from me and take away a 2nd Nebraska national championship. ESPN broadcast from the game and Lee Corso finally picks Texas to win. For the first time, I don't hate him that he is always right. #4 1998 - Texas A&M @ Austin - Unranked Texas dominates the #6 10-1 Aggies through 3.5 quarters. The aggies #2 rated defense gives up 483 yards to Texas after averaging 250 for the season. The much maligned Texas defense holds the aggies to minus-7 yards rushing and 173 total yards. Ricky Williams shatters Tony Dorsett's 22 year career rushing record with a 60 yard touchdown run in the first quarter. Ricky goes on to rush for 259 yards and a Heisman trophy two weeks later. Fumbles and bad special teams allow the aggies to take the lead with 2 minutes left. A 70 yard drive and Stockman's final and fourth field goal of six tries wins the game (26-24) with 5 seconds left. 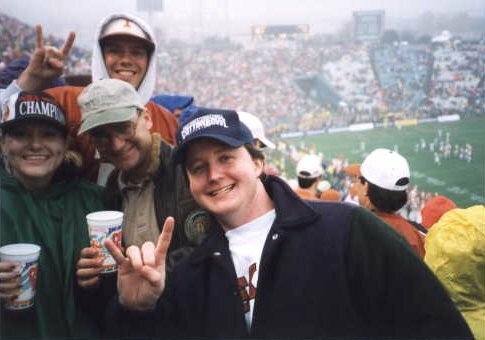 #3 1999 - Mississippi State @ Cotton Bowl - Ricky Williams completes his Texas career with 203 yds on 30 carries with 2 TDs and one Heisman Pose, Major Applewhite throws for 225 yds and 3 TDs, the Texas Defense shuts down Mississippi State's offense, and Jackie Sherrill tastes long overdue defeat from Texas. 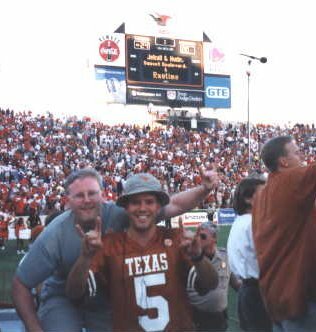 The game was Texas first Jan 1 bowl victory and Cotton Bowl victory since 1982 and brought the return of the fabled #60 jersy for the first time since the harsh 1991 Cotton Bowl as Dusty Renfro wore the number last worn by Brian Jones during the 1990 season. #2 1990 - Houston @ Austin - Undefeated, #3 Houston comes to Austin, having humiliated Texas the last three years, 47-9, 66-15, 60-40, with its nation leading run-and-shoot offense. Texas amasses 626 yards and holds the nation's leading team for total offense and passing to only 391 yards. David Klingler hits the ground after every pass and has bloody elbows and knees you can see from the upperdeck. With more than a minute left in game and Texas winning 45-24, the fans rushed the field and 10 minutes went by before the game could continue. #1 1989 - Oklahoma @ Dallas - At my first ever OU game, Texas hadn't beaten OU in 5 years and were on their way to their 2nd losing season in a row. The Texas mistake-ridden offense actually drove the ball for a TD after the opening kickoff. On the kickoff after the TD, the OU return man is hit hard and loses the ball in the air. The biggest, slowest Texas player on the field catches the ball in the air and falls into the endzone for a TD. The extra point kick is blocked back into the hands of the UT kicker who calmly throws the ball into the endzone for a 2 pt conversion!!! Texas takes a 17-7 advantage into the half. OU shuts Texas down to zero first downs in the second half and takes a 21-17 lead into the final 2 minutes of the game. Texas marches the ball down the field ending with a diving 25 yd Johnny Walker TD pass to seal the victory. 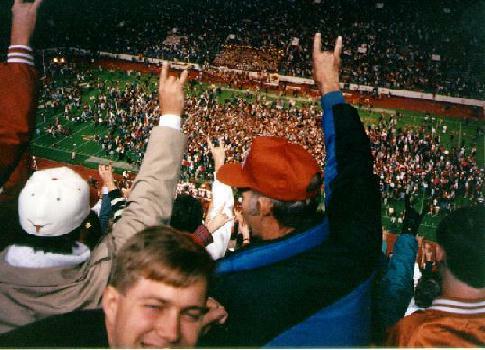 Texas students rush the field and take turns kissing the ground where Johnny Walker landed with the winning TD. We were never allowed to enter the field again. The endzone paint must be toxic.